The artist; (his estate sale, Hôtel Drouot, Paris, 4-5 February 1884, no. 59); (Portier, Paris). (Durand-Ruel et Cie, Paris and New York), c. 1900. (Paul Cassirer, Berlin). Max Liebermann [1847-1935], Berlin, by 1904; by inheritance to his daughter, Mrs. Kurt Riezler [née Käthe Liebermann, 1885-1952], Berlin and later New York, until at least 1949. (Wildenstein and Co., New York). Paul Mellon [1907-1999], Upperville, Virginia, by 1966; bequest 1999 to NGA, with life interest to Mrs. Mellon; life interest released 2006. The early provenance is according to Denis Rouart and Daniel Wildenstein, Edouard Manet: Catalogue raisonné, 2 vols., Lausanne and Paris, 1975: I:no. 297, repro. The painting was number 488 in the inventory taken of the artist's possessions after his death in 1883. Published as in Liebermann's collection in Ferdinand Laban, "Im Zwanzigsten Jahre nach Manets Tode." Zeitschrift für bildende Kunst (1904): repro. 35. 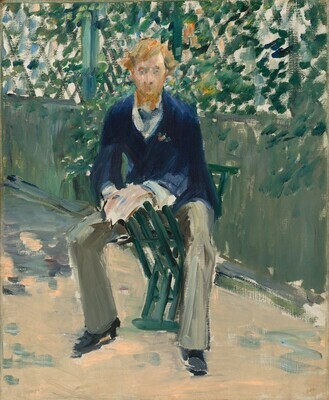 This painting was among 14 from Liebermann's collection that were sent to the Kunsthaus Zürich in May 1933 and later released to his daughter Käthe Riezler. (See Walther Feilchenfeldt’s letter to Dr. Wartmann of 2 May 1933 published in Max Liebermann und die französischen Impressionisten, Düsseldorf, 1997: 239; "In the list of pictures that Max Liebermann is leaving in Zurich for safe keeping is “6. [Manet,] George Moore.”) The Riezlers left Europe for New York in 1938. The painting was lent by them to a 1948 exhibition at Wildenstein, New York, and again to an exhibition of their collection in San Francisco in 1949. See Karl-Heinz Janda and Annegret Janda, "Max Liebermann als Kunstsammler" in Forschungen und Berichte 15 (1973): 103-149. Included in a 1966 exhibition of of the Mellon collection at the NGA. A Loan Exhibition of Manet for the Benefit of the New York Infirmary, Wildenstein, New York, 1948, no. 28, repro. 19th Century French Paintings from the Collection of Mr. and Mrs. Kurt Riezler, New York, M.H. de Young Memorial Museum, San Francisco, 1949, no catalogue. French Paintings from the Collections of Mr. and Mrs. Paul Mellon and Mrs. Mellon Bruce. Twenty-Fifth Anniversary Exhibition 1941-1966, National Gallery of Art, Washington, D.C., 1966, no. 43, repro. Manet: Portraying Life, Toledo Museum of Art, Royal Academy of Art, London, 2012-2013, no. 32, repro. Duret, Théodore. Histoire d'Edouard Manet et de son oeuvre.Paris, 1902: no.246. Laban, Ferdinand. "Im Zwanzigsten Jahre nach Manets Tode." Zeitschrift für bildende Kunst (1904): repro. 35. Duret, Théodore. Manet and the French Impressionists. Translated by J.E. Crawford Flitch. London and Philadelphia, 1910: 249, no. 246. Hancke, Erich. "Manet als Porträtmaler." Kunst und Künstler (February 1910): 148. Meier-Graefe, Julius. Edouard Manet. Munich, 1912:: 272, repro. Moreau-Nélaton, Etienne. Manet, raconté par lui-même. 2 vols. Paris, 1926: II: 54, repro fig. 237. Tabarant, Adolphe. Manet: histoire catalographique. Paris, 1931: no. 306. Jamot, Paul, and Georges Wildenstein. Manet. 2 vols. Paris, 1932: 1:no. 338; 2: fig. 201. Rey, Robert. Manet. New York and Paris, 1938:40, repro. André, Albert. Edouard Manet. Paris, c. 1940: repro. 49. Tabarant, Adolphe. Manet et ses oeuvres. Paris, 1947:360, no. 325, repro. Martin, Kurt. Edouard Manet. Stuttgart, 1958: under no. 21. Goldwater, Robert. "The Glory that was France." Art News 65 (March 1966): 42, repro. 43. Neugass, Fritz. "Jubiläumsschau in der National-Galerie in Washington." Weltkunst XXXVI, no. 8 (15 April 1966): 336, repro. Young, Mahonri Sharp. "The Mellon Collections: The Great Years of French Painting." Apollo 83 (June 1966): 427-428, repro. Bodelsen, Merete. "Early Impressionist Sales 1874-94 in the light of some unpublished 'procès-verbaux'." The Burlington Magazine 110 (June 1968): 242, no. 59. Orienti, Sandra and Denis Rouart. Edouard Manet. Paris, 1970: no. 278a, repro. Janda, Karl-Heinz and Annegret Janda. "Max Liebermann als Kunstsammler." Forschungen und Berichte 15 (1973): 103-149. Rouart, Denis and Daniel Wildenstein. Manet: catalogue raisonné. 2 vols. Lausanne and Paris, 1975: I:no. 297, repro. Kopper, Philip. America's National Gallery of Art: A Gift to the Nation. New York, 1991: 277. Natter, G. Tobias and Julius H. Schoeps, intro. Max Liebermann und die französischen Impressionisten. Published in conjuction with exhibition at the Jüdisches Museum, Vienna. Düsseldorf, 1997: 214-215, repro., 239-240.